Passion fruit muesli, a stuffed grape leaf, a boiled cage-free egg, fresh pineapple, marinated mozzarella and pepper jack cheese, olives, grapes and pita. The best lemon poppy seed pound cake I’ve ever had. 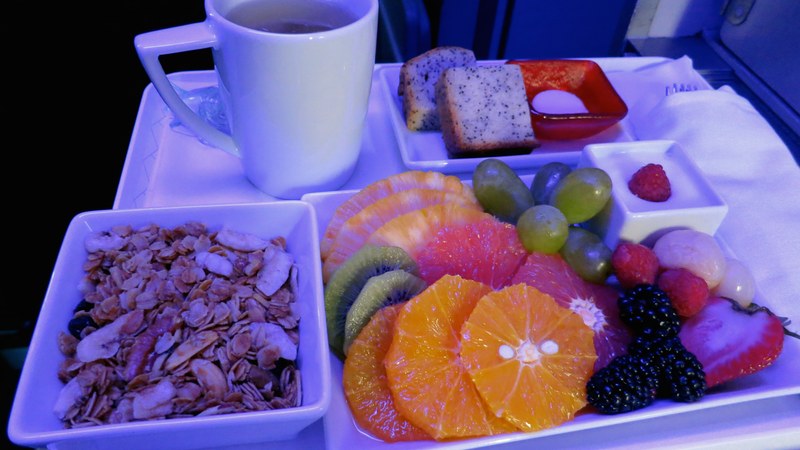 Only Virgin America could think up a breakfast like that! And that was just one of three first class breakfast options on my recent flight from Boston to San Francisco. 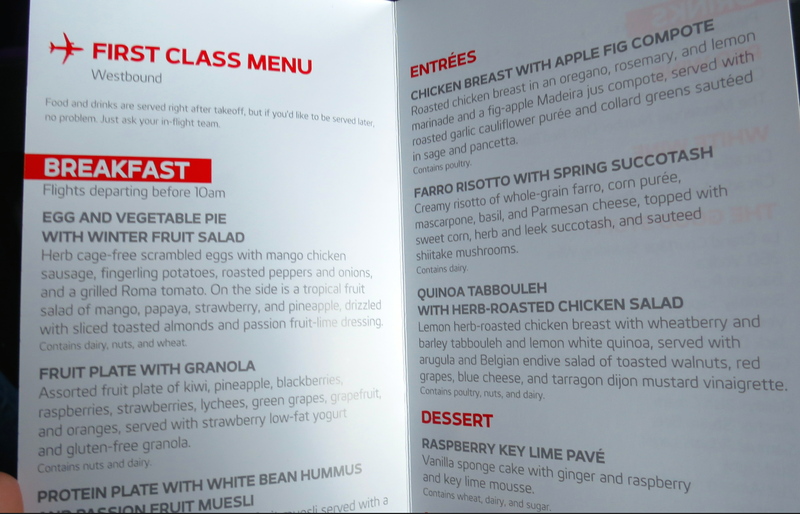 Back in March, Virgin America really whomped up its first class menus on long haul business flights between San Francisco and Los Angeles to Newark, New York, Boston and Washington, DC (Reagan). And it’s not just breakfast getting the royal treatment—snacks, lunch and dinner got an upgrade, too. Unusually good food onboard is one of Virgin’s primary weapons in the increasingly competitive transcontinental business/first class market. 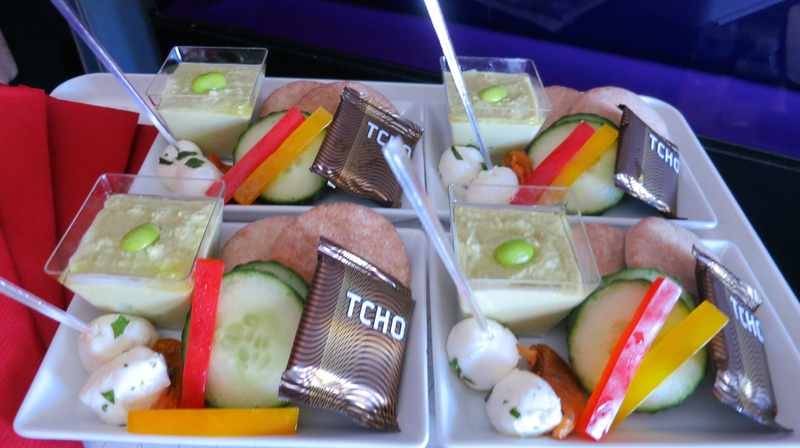 For example, passengers in Virgin’s eight-seat first class section now enjoy cocktail hors d’oeuvres of roasted tomato, marinated artichoke heart, olive and mozzarella on a skewer, served with warmed mixed nuts. At mealtime, there’s a choice of two appetizers and three entrees in-flight served on china, glass and linen. Oh, and there’s hot towel service, too. 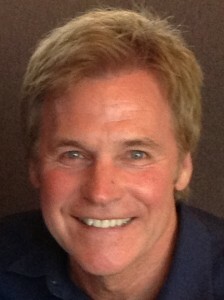 Tell me a little bit about what I chose for breakfast– the protein plate. Who thought that up? You can’t go wrong with fresh chicken or turkey, a small amount of cheese and a hard-boiled egg. 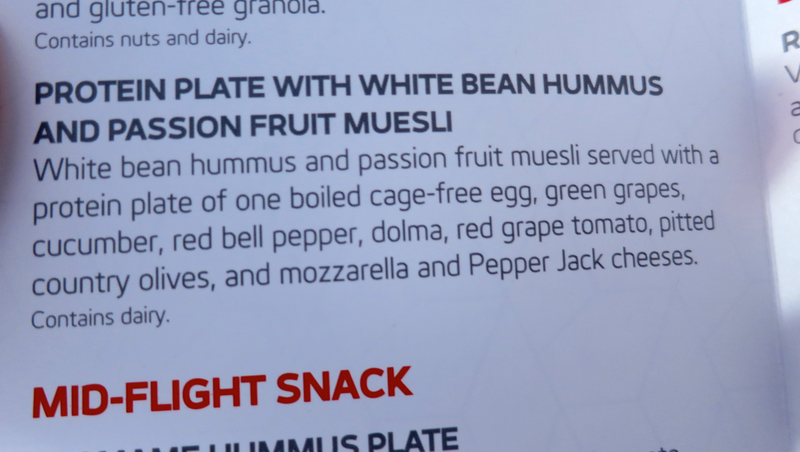 In addition to the basic protein plate, we developed a few versions of the high protein low carb offering by adding other components like a grain salad or stuffed grape leaf. This plate was heavily influenced by our frequent flyers who let us know that they were looking for a healthy inflight option that was low in carbs but high in protein and most importantly, high in flavor. Who makes that awesome lemon poppy seed pound cake? Sweet Sam’s Baking Company, Bronx, NY. Who thinks up exotic items like passion fruit muesli? Interestingly, the simplest things can be made exotic with a simple, small addition. In this case we played around with a basic creamy muesli recipe and took it to the next level by incorporating passion fruit puree.As the only California-based airline, we always provide travelers with seasonal and locally sourced food options. We work in conjunction with LSG Sky Chefs to develop menus using sustainable and fresh ingredients, including local fruits and vegetables, premium meats and artisan breads. What’s the most requested breakfast item in first class? 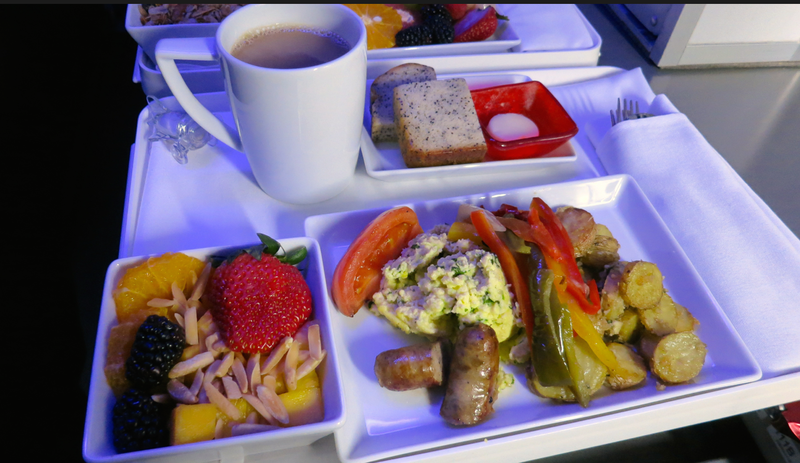 In our First Class cabin, the fruit plate with granola and yogurt is our most popular item currently, followed by our fresh, cage-free eggs and sausage. Interestingly though, one of the most popular breakfast entrees ever was chilaquiles, a traditional Mexican dish made with corn tortillas, salsa, eggs, cheese and beans. Some of our most popular snacks are local San Francisco brands like the Sea Salt Caramel 479° Popcorn, Krave Basil Citrus Turkey Jerky and Cheddar Popchips. Is the food served on Boston flights the same as on I’d see on JFK flights? Is breakfast this ornate on shorter haul flights? 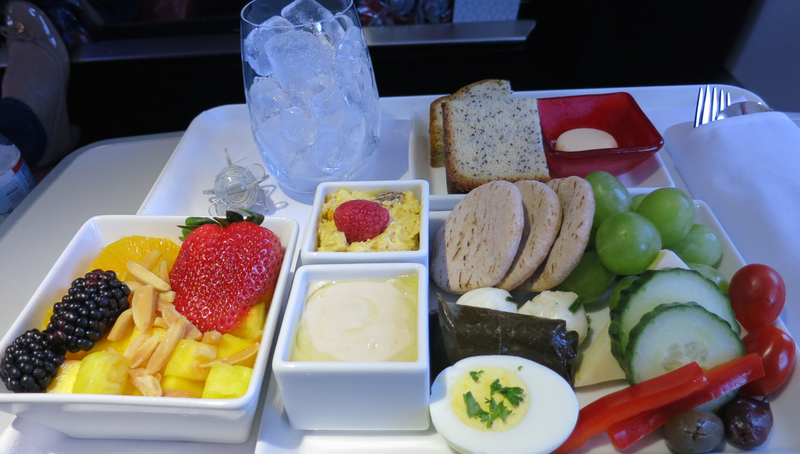 First Class guests on shorter flights are served smaller versions of our long haul breakfast menus – currently a ramekin of passion fruit breakfast muesli with a skewer of tropical fruit or edamame hummus with pita slices and an antipasto skewer. What type of coffee do you serve? 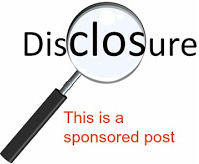 Where does it come from?